You can build a solar filter for a large aperture scope for less than $40, including the solar filter film. This is a great project to build with your kids, or perhaps as part of a classroom activity. I describe how I built a solar filter for my 10" F/7 Dobsonian scope, but you can easily adapt these instructions for other scopes. For daytime use, we build an off-axis filter smaller than the scope's full aperture. For convenience sake, an off-axis mask on a large Newtonian is easy to make, takes less material and the off-axis size is often more than enough given the daytime seeing. Measure the distance from the focuser to the end of your telescope tube. Draw out two long rectangles on the poster board, whose height is the distance you measured. Measurements. 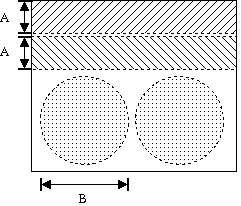 A = distance from focuser to end of tube; B=diameter of tube. Draw strips and circles on the posterboard. Cut out the strips of cardboard. These two strips double up to form the sidewalls of the filter. 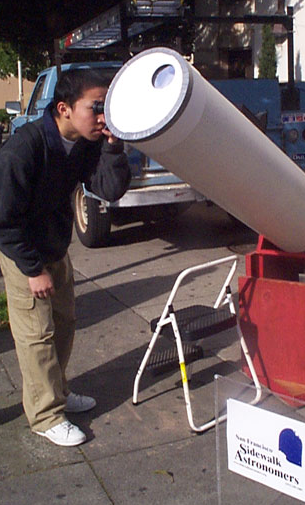 Using a compass, measure out two circles the diameter of the telescope tube on the posterboard. On one of the circles, use the ruler to draw out lines indicating the vanes of your spider assembly. Then use the compass to draw a circle in the center representing your diagonal. Finally, draw a large circle the diameter of your mirror. Using the compass, draw an off-axis circle within the diagonal, spider vane and mirror lines. For my 10-inch scope with a four vane spider and a 1.85" diagonal, a 3.5-inch off-axis aperture fits perfectly. Cutting the aperture hole. A = diameter of tube. B = diameter of mirror. 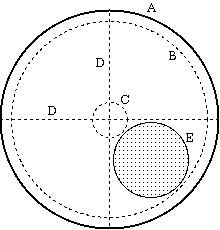 C = diameter of center mirror. D = spider vanes. E = aperture hole for solar filter film. Cut both circles from the posterboard. Cut out the inside of the aperture hole from the one circle. Sharp scissors and/or a sturdy razor blade are useful to cut through the heavy posterboard. Place the circle with the aperture hole atop the other circle. Trace out the aperture hole outline onto the other circle. Cut the second aperture hole. You may need to smooth out the edges of both aperture holes with some fine sandpaper. Take the strips of cardboard, and arrange them into a circular collar the same circumference as one of the circles. At one end where the strips overlap, join them with tape into one long strip. Temporarily tack the other side of the collar so that it forms a cylinder. Join strips together, so the length is the circumference of the telescope tube. Join remaining ends into a cylinder. Test fit the collar against your telescope tube. Adjust the diameter of the collar for a snug fit. Then seal the other end of the collar with packing tape, to permanently form the cylinder. Attach one of the large circles to one end of the collar. Cut duct tape into six-inch strips, then cut notches about every 3/4 to 1 inch along the tape. Cut the notch halfway across the width of the tape. Cut notches halfway through the tape. Fold the tabs of tape to match the curvature of the filter collar. Place the uncut end of the tape along the edge of the collar, then fold the tabs over the circle to follow the curve of the top. Hold the cap up to a bright light, and check for small pinpoints where light may be showing through the tape. Cover any holes with small patches of duct tape. Take the remaining circle, and place it inside the cap. You may need to trim or sandpaper it a bit to get it to just fit within the cap. Line up the aperture holes of the two circles. On both the sidewall of the cap and the circle, make some alignment marks and label them A, B, C, D, E.
Arrange the newspaper or tissue paper on a table. Cut out a square of solar film with sharp scissors or a razor, carefully following the instructions which came with the film. You do not want to scratch the film or create pinholes. Take the free circle, and use Scotch tape to attach the solar film over the aperture hole. Do this on the side opposite the alignment marks. Do not stretch the solar film tight; this will ruin its optical properties. It should be loose and maybe a little billowy. Insert the free circle into the filter, and realign the alignment marks. Seal into place with packing tape. Hold the filter up to a bright light to look for pinholes in the film. Dot the pinholes with a black or blue permanent marker. You can use a halogen lamp, but do not get too close to the lamp! The heat from the lamp will stretch or melt the film, ruining the filter. The filter is now complete. Place the filter over the end of your telescope and enjoy. Inspect the filter every time you use it, to ensure there are no holes or scratches in the film. Make sure the aperture isn't obstructed by a spider vane. To aim the telescope, do not use your finderscope or Telrad! Instead, point the telescope until it casts the smallest shadow possible behind it. If your scope has an open tailgate, you will need to cover it with some type of shroud to prevent daylight from leaking in the scope and overpowering the view. You may need to counterbalance your scope against the added weight of the filter. You can use these plans to build an off-axis aperture filter for Moon viewing. A Moon filter lowers the brightness of the Moon through medium and large aperture scopes. Just omit the inner circle, and the solar safety film.